The economics professor, Wadan Narsey, has a told a New Zealand media team that he's been threatened over his demographics paper, which shows the Indo-Fijian population is dropping dramaticlly. Narsey is quoted in the Michael Field interview as saying "It is big news because it sharply reduces the ethnicity factor in Fijian elections." The USP professor says his paper (see the Coupfourpointfive story on the Narsey population statistics in older posts) has been banned in Fiji but has been circulated elsewhere. "The censors won't allow it," he told Field from Suva. "I hope I don't get taken in, they have rung me and threatened me." He insisted on his right to discuss data of major significance. "If you want to live life like a human being, you have to live it. If we cannot do the things that are our responsibility then we are not fulfilling our responsibilities as teachers and elders." In the paper, Dr Narsey said Fiji is going through a "population revolution". Data now available from the 2007 Census indicated that by 2027 Indo-Fijians will make up just 26 percent of the population, while indigenous Fijians will count for around 70 percent. The data showed that while higher emigration was a factor, there was also a dramatic fall in Indo-Fijian fertility. 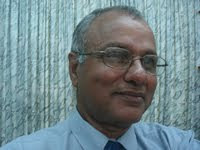 Dr Narsey said for more than 50 years the racial balance has been Fiji's "politically explosive issue". The issue was behind all four of Fiji's coups between 1987 and 2006. Commodore Bainimarama was trying by decree to create a multi-racial electoral system, but Dr Narsey said the numbers show that indigenous government is inevitable. The birth rate among the Indo-Fijian population is now around two children per woman, while the Fijian rate is three. Dr Narsey speculated that indigenous leaders have been pressing on village communities to have big families for electoral advantage, while Indo-Fijians have gone the other way because of flexibility when trying to emigrate. In education the population change was "remarkable and potentially revolutionary" with a mjaority of indigenous Fijian in Hindu schools. "It's a remarkable change, and they are fundamental changes taking place out in the country... it is going to have some marvellous impact on multi racialism in the country, much more so than these silly military decrees." Emigration had affected the Indo.Fijian population. "We are losing all of our intelligentsia ... anybody who is bright and had get-up-and-go, has gone. What we have left is pretty much intellectually rudderless." He said it was sad for people like him who had seen virtually everyone of his generation leave. "You find you are in a social vacuum." But, he said, he did not plan on leaving: "this is where I belong... fortunately my wife agrees with me." Thank God for Professor Warden Narsey - one of the very,very few good men still standing in Fiji. You are so loved Professor, for your bravery, your honesty and kindness. Wadan, you say it as it is-not as the Govt want it to sound! That is why the military is getting infuriated! Keep it up-you are the sound of sanity during these greatly disturbing times. I wish you could give weekly columns in the "public media" on basic things that affect the daily lives of the grassroot people from an economic perspective. Your contributions are so enlightening! Oh I forgot to add (see how I get carried away with the good Professor:))Anyway, what I wanted to add which I think is really important to bear in mind as an i-taukei, at least for me, is that whatever the demographics now and particularly the projection made for the next decade, the inclusion of and positive value and contributions by minority groups will require greater understanding, acknowledgment and recognition from the majority group i.e. the i-taukei. To my mind, that is the real test for the current cries & sentiments being expressed so freely on these anti-coup, anti dictatorship, pro-democracy blogs - do we have the courage of our conviction for a true democratic Fiji that is deeply rooted in notions of fairness, justice, rule of law, inclusiveness, non-discriminatory and all those lofty ideals that we all aspire to; OR are these just rhetorical statements made only for political convenience?! i am sure even aiyaz must sit at home and chuckle about some of the comments he feels he needs to make defending openness and rubbishing a human rights report despite his being part of illegal regime and corrupt with no mandate to change anything. Tick tock tick tock...is that the cops at the door to charge you with taking an illegal oath !!! Don't talk rubbish - go back and learn your history. (pre independence). If the Taukei hadn't stood up for their rights we'd have been another Indian outpost - all that that entails. So don't dribble on about fairness etc - you and your forefathers had your chance - and you blew it.